The sweetest plants in my garden are neither berries nor tree fruits, but the lanky green herb known as stevia. Called kaa-he-he in its native Paraguay, stevia leaves have been drunk in tea for thousands of years, and more recently have become a global food commodity. In 2012, sales of stevia for processing into sugar substitutes topped $300 million. I am suspicious of processed products derived from stevia, but have no qualms about growing my own and using the leaves to sweeten herb teas, which I think is their best use. Historical records from 500 years ago report members of the Guarani tribes chewing on the leaves, but I do not recommend this. 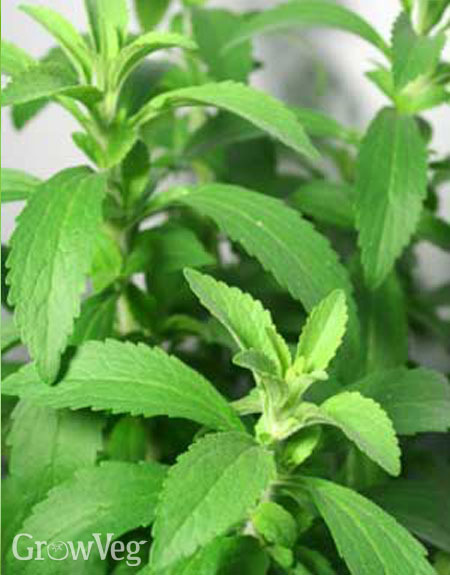 A hundred times sweeter than sugar, chewing only one stevia leaf is like eating three packets of artificial sweetener. Yuck. The question of processed product versus whole herb answers itself when you start growing stevia, which produces spurts of harvestable leaves through the summer. Then, in all but semi-tropical climates, a mother plant must be kept alive through winter indoors, from which the gardener roots new plants in early spring. In good years when my plants grow well, there always seems to be fresh or dried stevia available, because a little goes a very long way. A tender perennial by nature, stevia is a warm-season plant that survives outdoors only where the ground does not freeze in winter. In the garden you can handle stevia like basil, but instead of starting with seeds you should begin with a plant. Tiny stevia seeds have low germination rates because they quickly lose viability, so starting with a plant grown from a rooted cutting saves time and frustration. Set out in warm, sunny soil, stevia produces upright branches that must be pinched back every four to six weeks if you want the plant to become bushy. These tips can be harvested and dried, along with whatever leaves you care to pick. The big harvest comes in late summer, when you can cut the plants back by half their size and dry the leaves. It’s important to do this before tiny white flowers form, because once stevia plants start to bloom, they won’t go back to producing new green leaves. Stevia plants can be hard to find in spring, so I like to keep a couple in my sunniest window through the winter. Some people dig up their outdoor plants, prune them back and nurse them through winter indoors, but I get better results by rooting cuttings in late summer, and growing the new plants indoors. Plants that have never known the intensity of full sun are easier to please indoors than large plants that have spent summer in the garden. Some people root stevia stem tips in water, but it is faster to set small cuttings in damp seed starting mix or perlite. I like to work with small side branches, pulled downward from the main stem with a slip of stem tissue attached. (The tissues at the stem/branch junction are loaded with cells capable of growing into roots). When kept moist beneath a florescent light, my little stevia cuttings develop roots in two to three weeks, at which time the best ones get promoted to their permanent spot in a south-facing window. Assuming the winter goes well for the stevia plants, they get a major haircut in spring, with the cuttings set to root until they show signs of new growth. When frost is history and the soil is warm, these cuttings get transplanted outdoors where they grow into the season’s crop. Stevia leaves are quick to dry in a dehydrator, or even between the pages of a book if you have only a few. When you have only small batches, the dry leaves can be crumpled in with other home-dried tea herbs such like mint, nettles and raspberry leaves. Home grown stevia also can be made into concentrated water-based extracts or alcohol-based tinctures, which are similar to commercial liquid stevia products in that they should be measured by the drop. I have made and used both, and here is an instance where alcohol extraction is not really necessary. Instead, make a simple stevia infusion: Add a handful of leaves to a cup of boiling water, remove from the heat and wait an hour. Strain the concentrate through a coffee filter, and store in the refrigerator in an airtight jar. Each batch will be a little different so experiment with how much to use. With super-potent stevia, it’s better to use too little than too much. "Our main use of sugar is in the cooking of fruit for crumbles etc. Is it possible to use a little Stevia infusion to achieve the same result please?" "Keith, sugar in fruit crumbles does more than sweeten -- it also caramelizes and does the magic dance with butter that makes the dish so good. You might want to try a stevia-sweetened yogurt or custard sauce over minimally-sweetened desserts. " "can stevia be grown in the southern part of the province of Ontario in Canada?" "Kirk, you can certainly grow stevia as a summer annual, but you will need to overwinter it indoors. Good luck!" "would I have to grow it from seed? what are the chances of getting a cutting or pre seeded/grown?" "Starting in April you can get a big plant from Richter's (richters.com) if you can't find one at a local greenhouse business that handles herbs. Starting with a plant is much faster than working with stevia seeds." "Good Article - will try to make some extract. Stevia is super easy to grow and propagate. We grew some this year- here are my experiences of growing and propagating. http://earthlychow.com/growing-and-propagating-stevia-stevia-rebaudiana"